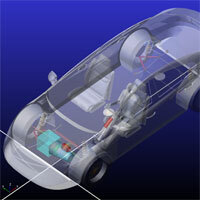 Regulators are continually increasing the performance standards required of automobile manufacturers. An example is FMVSS 105 and 121 which define the performance of braking systems and are intended to ensure safe braking performance under normal and emergency conditions for heavy trucks and trailers. 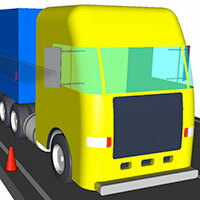 A typical change in these regulations is to reduce the distance required to stop the truck under emergency conditions. 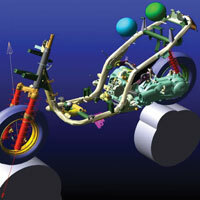 This can be achieved by designing bigger, heavier, more expensive brakes. Ragnar Ledesma, Principal Engineer for Meritor, took a different approach by addressing the algorithms used to control anti-lock braking systems used in nearly all medium- and heavy-duty trucks. The simulation showed the proposed control system brings the vehicle to a complete stop in less than 4 seconds in a stopping distance of 177 feet (54 meters), demonstrating a way to meet the requirements of a tougher regulation without major changes to braking hardware. The results show a nearly constant deceleration response at the driver seat as opposed to the cyclical response with conventional ABS braking. 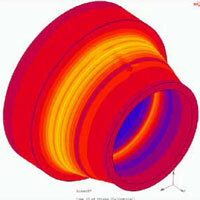 The explanation for the improved performance is explained by the simulation results. The wheel angular velocities and tire slip ratios do not fluctuate from their desired values, hence the new ABS control system can sustain maximum braking forces almost over the entire braking cycle. The National Aeronautics and Space Administration’s (NASA’s) Space Launch System (SLS) will be the most powerful rocket in history, launching crews of up to four astronauts in the Orion spacecraft to explore multiple, deep space destinations. The SLS is designed around an evolvable architecture that will support versions ranging from 77-metric-ton (77 ton) to 130 metric ton (143 tons) lift capability. The SLS core stage, more than 200 feet tall with a diameter of 27.6 feet, will store cryogenic liquid hydrogen and oxygen that will feed four RS-25 engines. The RS-25 served as the Space Shuttle main engines and operated with 100% mission success during 135 missions. The RS-25 is being modified to serve on the SLS by increasing its power from 491,000 to 512,000 pounds of vacuum thrust among many other improvements. Compared to other joining methods, bonding composite structures with adhesives distributes the load over a larger bond area, reduces weight, joins dissimilar materials and provides higher stiffness and toughness. Bonding also generally reduces manufacturing costs. However, when using adhesive bonding for composites it can be very difficult to determine if the bonded joint meets structural requirements without destroying the part. UCI researchers used MSC Nastran and Patran to simulate the operation of quantitative percussion testing to reduce the need for physical testing and eliminate the potential for manufacturing errors. Perfect the use of percussive testing in a wide range of applications. Evaluate the ability of the test to clearly distinguish between well bonded and kiss bonded panels. Search and rescue is extremely hazardous work and there are some areas which cannot be reached by humans because the danger is too great. A new generation of robots is being designed to address these challenges. 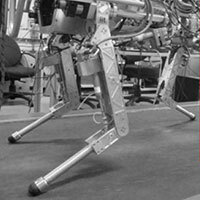 While there are a number of different potential search and rescue robot designs, one of the most interesting is a four legged robot being designed by the Dynamic Legged Systems Lab led by Dr. Claudio Semini (Italian Institute of Technology) to perform dynamic tasks such as walking in rugged terrain, carrying heavy loads, climbing hills and even jumping and running. The manipulation of objects is fundamental to virtual reality applications. Better methods are needed to grab and manipulate virtual objects by moving one’s hands in 3D space. 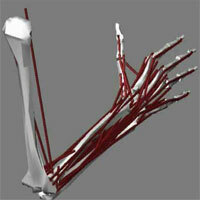 But the anatomical complexity of the human hand makes it very difficult to accurately track manual motions. 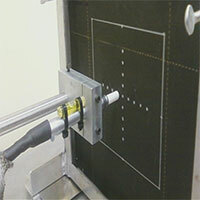 Haptic technology, which recreates the sense of touch by applying forces, vibrations, or motions to the user, provides cues in object manipulation. Haptic interfaces are essential in order to generate sensations relating to touch and effort. Active hand mounted devices make it possible to accurately track the hand and feel virtual objects with the fingers but they are complex and costly. The reactor pressure vessels make up the heart of a nuclear power plant, containing the core, core shroud and coolant. In water-cooled water-moderated energy reactors type power plants, nozzles on the ferritic steel pressure vessel are welded to primary coolant pipes made of austenitic steel. These nuclear power plants were built and started operating 20 to 30 years ago. The company operating one of these power plants needed to know how these welds can be expected to perform after a long period of service. It’s not practical to perform measurements on the reactor itself because of the complex geometry and the presence of radiation. Building and testing a duplicate structure would be expensive and it would also be very hard to replicate the effects of 20-plus years of operation. So the operator of the power plant agreed with the Department of Structural Integrity at Bay Zoltan Institute for Logistics and Production Engineering (BAY-LOGI) to simulate the manufacturing process to better understand the characteristics of the welded joint. Litens Automotive Group’s patented TorqFiltr torque modulator uses an arc spring isolator mechanism to decouple the accessory drive system inertia from the engine torsional vibrations. 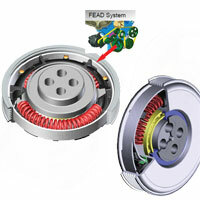 The Litens torque modulator controls the system resonant frequency by tuning the spring stiffness to the system inertia. Because the spring stiffness is softer than traditional rubber isolators, vibrations from the engine are mostly absorbed before being transmitted to the accessory drive belt. This results in isolation of all components in the accessory drive, and any accessory drive resonance has very small peak amplitudes, since there is very little excitation. 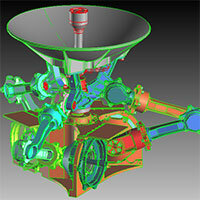 The Marc simulations have previously been found to be very close to physical measurements. 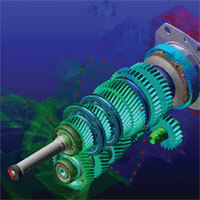 The co-simulation results for key values, such as the inner drive angle as a function of input torque, were found to vary by less than the 10% from the Marc simulation over two revolutions of the input shaft. Humans lose bone mass with age because their bones lose calcium and other minerals and become lighter, less dense and more porous. As this process continues, our bones become weaker, increasing the risk of bone fracture. A patient is said to have osteoporosis when bone mineral density (BMD), the concentration of minerals in a unit volume of bone, falls below a threshold value. This innovative solution to osteoporosis developed by Infosys uses computer-assisted design and FEA for the evaluation of fracture risk of the vertebrae quantitatively. Stresses computed through the simulation provide more accurate assessment than traditional BMD measurements in the determination of fracture risk. It applies best practices in mechanical engineering to understand the biomechanics of vertebrae. Using MSC Nastran to study the mechanics of vertebrae while taking into account various factors such as the shape, density distribution of cortical/cancellous bone and other material properties of bone tissue and porosity. Noise/vibration/harshness (NVH) and fuel economy often must be traded off against each other during the vehicle design process. When developing a new vehicle model, engineers are responsible for meeting a wide variety of often conflicting performance targets. Fuel economy and NVH are two of the most important categories of targets. Scania transmission components are developed as part of Scania’s integrated powertrain with a perfectly matched specification for each individual demand. The gearboxes are designed to suit the high-torque Scania engine range. The multitude of drive axle and bogie options provide optimum strength without inducing a weight penalty. Integrated powertrains are offered to customers on a modular basis in which nearly any gearbox can be combined with nearly any engine. The traditional approach to the design of gearbox and powertrain components involves creating an initial design based on one-dimension powertrain models and engineering calculations and then building and testing a prototype. With this approach, undesirable properties are identified during physical testing at a late stage in the design process when changes are expensive. Another concern was that the cost involved in building and testing different gearbox-engine combinations can be very high, especially if prototypes have to be rebuilt and retested because the design did not match what was intended the first time. Scania has addressed this challenge by making extensive use of MSC Software’s Adams multibody simulation (MBS) 3D powertrain models that accurately predict transmission dynamic behavior. Scania powertrains are now developed in a virtual environment in which a large number – often thousands – of design alternatives are simulated and evaluated as software prototypes. 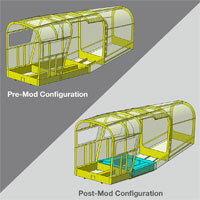 Simulation predicts the performance of design alternatives prior to committing to the time and cost involved in building and testing physical prototypes. Simulation enables Scania engineers to quickly evaluate functional virtual prototypes of power transmission assemblies and components. Working in the MSC Software Adams simulation environment, Scania engineers can exercise powertrain designs under a wide range of conditions using the same tests they normally perform in a test lab but in a fraction of the time. 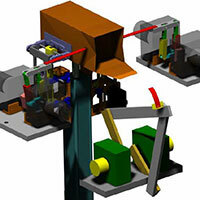 Modifications are validated in the virtual world, which saves a significant amount of time and money in the design process. 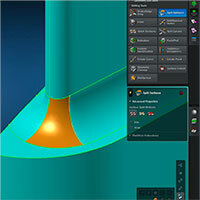 In some cases engineers have solved quality issues 30 percent to 40 percent faster when running simulation and measurements in parallel due to better understanding of the product.